Macie & Gabey at the pumpkin patch! Ms. Tracy's class went on a super fun field trip today to the Pumpkin Patch! They played lots of fun games and had a Halloween Party too! We love Butterfly School & Ms. Tracy! cute video of macie... except i turned out the lights at the wrong time!!! don't worry, she corrected me! so excited to wear her costume to gymnastics!! we roasted the seeds after we finished the carving! this is our jack-o-lantern... his name is "rockstar"
we luv halloween at our house!! macie baked this cake today... complete with halloween sprinkles of course! she was so proud!!! but settled for the baby pumpkin (only.50 cents...) didn't get to do the hay ride... the tractor got stuck in the mud before we got our chance! had to pose with her fav.... minnie mouse!!! through the month of September, Macie's Sunday School class has been learning about creation. last Sunday, Macie's class made the traditional "creation pillowcase." they have been making them at Riverside for years. next to the fish is a 'glow in the dark' moon and stars, macie's favorite part! Today was Picnic with Daddy day at Butterfly school!! 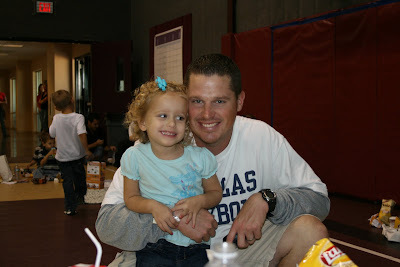 Macie was soooo excited that daddy was coming to eat lunch with her... she has been talking about it for days! !